IMFT says flash manufacturing is on a 12- to 15-month refresh cycle. The 25nm process represents fourth-generation technology. Back in 2006, the process technology was at 72nm, 2008 was at 50nm, and last year, with the introduction of Intel's X25-M, it dropped to 34nm. The improved manufacturing efficiencies will translate into clearly tangible benefits for consumers once production ramps up to full volume in the second quarter (today's announcement indicates IMFT has completed sampling to customers). Neither Intel nor Micron has formally announced product, but both companies indicated we can expect to see the new flash in products "later this year." Previously, it's been reported that Intel will refresh its solid-state drive (SSD) line in the fourth quarter. With 24nm flash, IMFT will be able to produce 2-bits-per-cell MLC NAND flash, with 8GB of storage on a single 167mm flash die. That's twice the capacity the previous 34nm process could produce, and it eliminates the need for IMFT's previously announced 3-bit-per-cell MLC flash, which increased capacity by increasing the bits-per-cell, but keeping the same 32nm process. For perspective, 167mm is small enough to fit through a CD's hole, and yet it packs more than ten times the data capacity. The long-term implications of this announcement are exciting, in a tangible way that many semiconductor manufacturing evolutions usually are not. By doubling the capacity on the 25nm process, it means we get to see double the flash storage in the same physical space as today. It also means higher manufacturing yields to produce the same capacities as are available today, since the 25nm flash won't require as many flash die to achieve a given capacity as the 34nm process required. This means consumers can expect to see a direct impact over the next year on how flash memory capacity across all types of products that use flash storage, from USB drives and memory cards to media players and tablets. SSDs are a major beneficiary, as well: After all, one of the biggest criticisms of SSDs today is their inability to keep pace with hard drive capacity. 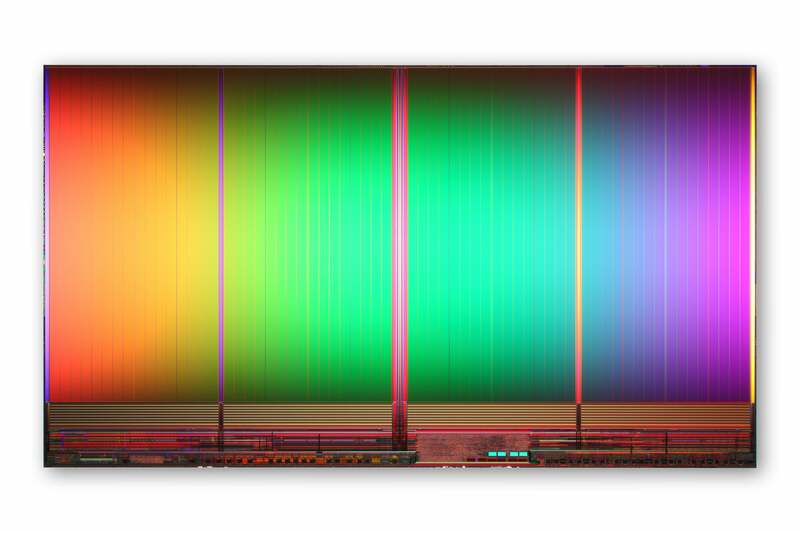 However, the idea of a high-capacity 600GB SSD in a 2.5-inch form factor will be viable, thanks to the 25nm process. While analysts expect SSD prices to remain at a premium as compared with magnetic hard disk drives, again the 25nm process should help bring manufacturing costs down over time. All of this sounds theoretical until put in real-world terms. For example, under the 34nm process, 64 of these NAND flash devices would have been needed before to achieve a 256GB SSD; with 25nm, manufacturers can achieve the same capacity with just 32 flash devices. A 64GB tablet needs just eight, a 32GB smartphone needs just four, and a 16GB flash card, just two. These manufacturing efficiencies in end products will be what helps bring manufacturing costs down, as well as improve product designs. IMFT emphasizes that the actual impact on prices will be determined by market forces, though. And Intel's Troy Winslow, director of marketing, notes, "When we went from 50nm to 34nm, we came out and reduced our price 60 percent by comparison. Will we do that again when we go to market later this year? I'm not going to say that. But our desire is to reach volume SSD, and we think we're uniquely positioned for that because of the value of our product."